Five years ago today, on November 4, 2008, Barack Obama won the presidency and became our first African American president. The historic moment may not have come as a surprise to many. Twenty years ago, about half of Americans (54%) thought the chances were good that we would have a black president by now, according to a 1993 Gallup/CNN/USA Today survey of U.S. adults, while 45% thought the chances were slim. Even after Obama’s election, about a third of American adults (35%) think it is unlikely that we will elect another black president by 2030. 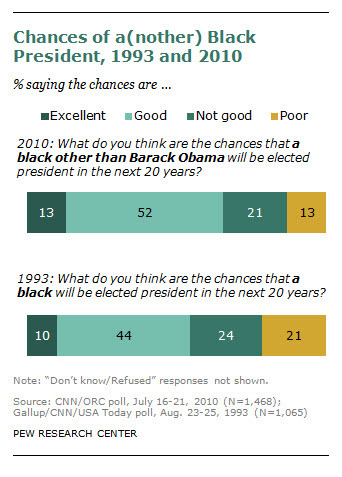 But the share that thinks the chances are excellent or good is somewhat higher than it was in 1993 – fully 65% of Americans think we will elect another black president in the next two decades, compared with 54% in 1993.